The project website defines graffiti as "handwritten inscriptions that have been incised or scratched into wall-plaster". The project digitizes ancient graffiti from the cities of Herculaneum and Pompeii. It aims to provide scholars with a flexible digital tool to search the inscriptions in their spatial context. Thus, the project spans epigraphy and archaeology. Both textual and figural graffiti (hand-sketched drawings) are available. More than 500 ancient graffiti are now searchable. These include more than 300 from Herculaneum and nearly 200 from Pompeii (from the Lupanar, Insula I.8, and other locations). The project website provides a sophisticated search engine that allows users to conduct a range of queries, including searches based on the location of the graffiti ("Search by Map"), by the type of property (e.g. public building, house, workshop), category of drawing (e.g. animals, boats, geometric designs), writing style, content of the inscription, and more. The epigraphical database and the search platform are interoperable with the EAGLE epigraphic database, the EDR (Epigraphic Database Roma) and the EAGLE Europeana Network. R. Benefiel, H. Sypniewski, "Images and Text on the Walls of Herculaneum: Designing the Ancient Graffiti Project," in: Off the Beaten Track. Epigraphy at the Borders, edited by A. E. Felle and A. Rocco, Archeopress (2016), 29-48. 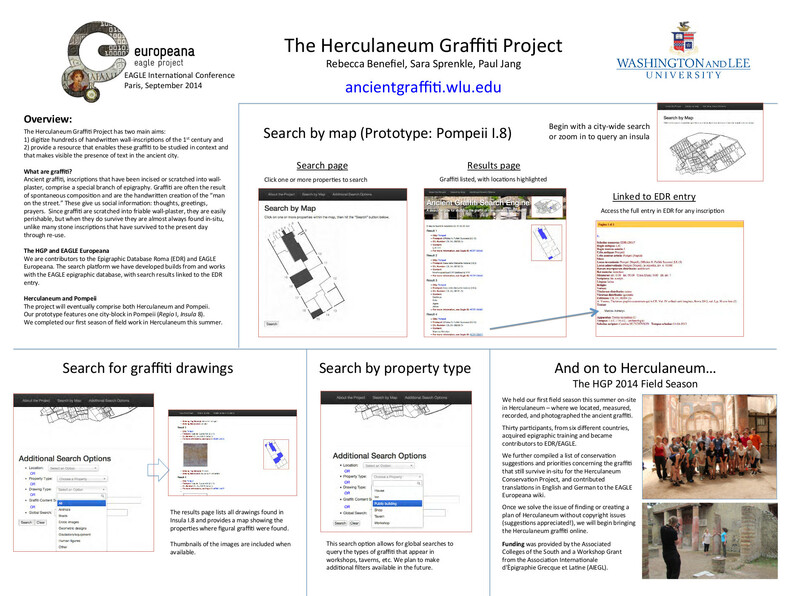 R. Benefiel, S. Sprenkle, P. Jang, The Herculaneum Graffiti Project, a poster presented at the EAGLE International Conference Paris, September 2014. This page was last modified on 4 October 2016, at 17:08. This page has been accessed 45,020 times.